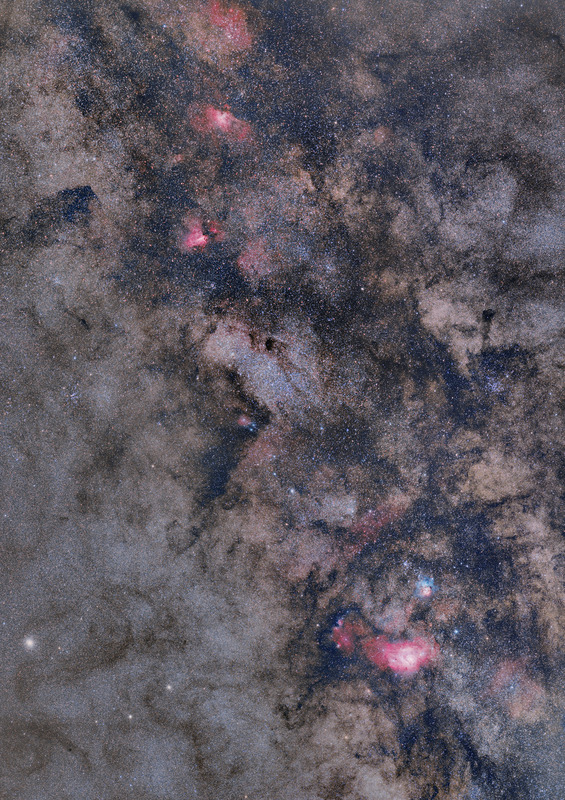 The constellations of Sagittarius and Serpens contain some of the densest and most beautiful regions of our Milky Way Galaxy. Highlighted in this four panel mosaic covering 11 by 15 degrees of sky are four of the grand nebulae catalogued by Charles Messier. At the top of this image is M16, the Eagle Nebula. A region of star development, the nebula is widely known for the Pillars of Creation which were made famous by the iconic Hubble Telescope photograph. Below the Eagle Nebula is M17, the Swan Nebula. This nebula is also known as the Omega Nebula, Lobster Nebula, and Check Mark Nebula. Towards the bottom of the mosaic is the combination emission and reflection nebula M20, more commonly known as the Trifid Nebula. The name comes from the trisected emission nebula at the bottom. The blue reflection nebula above it is actually behind the emission portion of the nebula. The dust in this part of the nebula reflects light from the hot blue star, thereby giving it a beautiful azure color. Below the Trifid Nebula is the largest nebula in the image, M8, the Lagoon Nebula. In addition to the extensive Ha regions throughout the nebula, M8 features numerous Bok globules - dark areas of the nebula where protostars are condensing from the gas and dust. Notes This was a tricky mosaic for me to put together. The area is so dense with stars that keeping them to some reasonably well managed level was difficult. Ultimately, I'm pretty happy with the final result, although it took me almost a year to put it all together!